I have a new logo up on the site, if you didn’t notice. It cost me hardly any time at all. It’s simple, it’s effective, it’s bright. And it was free to make with a Squarespace account (you know, the fantastic website tool company that single-handedly keeps the podcast community in business). I’ve been wanting to move away from my nebulous (but consistent) avatar image for a while. The ambiguous, pixelated “walking hot dog man” has been a fun representation of my digital presence, but it’s been more of a personal thing than branding for a site. And I felt that Defiant Sloth needed something different. But like many projects, the onerous task of recreating a logo kept getting pushed to the side. Designing and creating a logo is no simple task. For Defiant Sloth, I wanted sloth imagery, for obvious reasons, and my initial sketches drew on warpaint inspirations (mostly because of the animal’s characteristic eyes and my “defiant” adjective), but I wasn’t up to the task of firing up Acorn or investing in an Adobe Illustrator-like program such as Sketch to hammer it out as a vector image. Then a very curious announcement was made: Squarespace launched an easy logo editor for the masses. Squarespace Logo was designed to help the small business, the logo-making deficient writer, the mom and pop shop, fast, quickly, and cheaply. After all, the company claims “logos can be comprised of a few basic elements: text, a tagline, and an icon.” And that’s exactly the editor canvas you get. Squarespace Logo makes creating a text + icon logo super easy. How is making a logo so easy? Let’s go back a year and a half or so to my digital marketing job, at which I still currently work. My responsibilities fall mainly in new business and current client growth, and as anyone who is familiar with meetings, pitches, and proposals, PowerPoint is your best friend (as unfortunate a reality as that may ring in your ears). Prettifying and simplifying presentations is sometimes a challenge, given color palettes and “loose” style guides directed by the company, so I began remodeling the visual representation of our services. To aid this redesign, I wanted to draw upon a library of well-articulated, simple icons. Around this time, an ambitious site was beginning to curate a massive catalog of professional, designer-backed icons to represent a breadth of worldly objects. The was (and still is) called The Noun Project. The Noun Project is sublime. Type in an object in its search bar (even intangible ones, like “success”), and you’ll be returned a dozen or more monochrome icons that have been titled or tagged with success. You find one you like, and can choose to either pay for it (if it’s attached to a monetary value), or use it free under the Creative Commons Attribution license. Naturally, the choice of download/use format is dictated by the designer submitting to The Noun Project. Only recently has The Noun Project began offering a Premium license for agencies, users, and companies of various sizes — and, apparently to some degree, Squarespace. 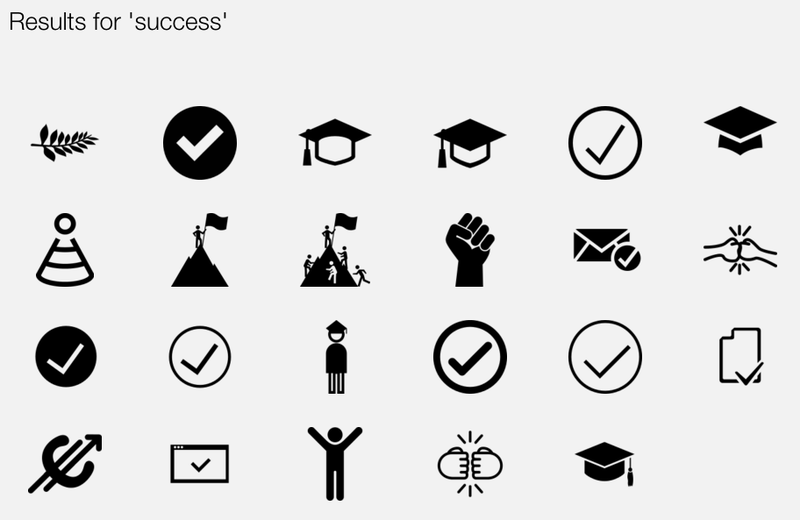 The Noun Project -- icon search results for "success"
So it was with silent appreciation that I finally understood the simplicity of Squarespace’s logo creation tool. You weren’t wrangling with vector tools, you were simply picking colors, resizing and aligning fonts and type, and searching for the one great icon via The Noun Project’s catalog to complete your logo. And so, that’s exactly what I did. My editing canvas for Defiant Sloth's new logo. Squarespace shows what the logo looks like across a few physical objects, too, like a business card and t-shirt. Nice details. Surprisingly, there has been unwarranted criticism towards Squarespace Logo from designers and technology writers since its introduction this past week. Many claim that Squarespace is discrediting the merits of hiring a professional logo designer by merely providing access to thousands of monochrome, simple, crisp icons. Nowhere in this move do I see an attack on the art form, and it’s ludicrous to assume that a top-tier brand (or even small business) would opt for using Squarespace Logo instead of a professional designer. Why is it designers feel threatened by this? Is it because any idiot can type in the name of their company, search for a cool or related icon, find a nice color, and then pay the $10 (or sign up for Squarespace) to get a copy of it? Squarespace Logo isn’t out to rob designers. It exists as another ancillary product to Squarespace’s existing website-building ecosystem. They are trying to making the web a prettier, smoother experience for everyone, and ridding the world of hideous logos is an appreciated next step. High-brow designers should get their heads out of their asses and thank Squarespace for urging logo-needing folks to take better care in the logos they choose to represent themselves, and, if anything, prompt them to take logo design more seriously. After all, Squarespace Logo is a limiting and simple affair — anyone can see that, and I speculate the majority of initial users actually needing a good logo will understand the only way to get one is through a professional.